ServeGR, a new hub for volunteer efforts in the region, helps centralize opportunities for those looking to give. Where nonprofits may have previously been hampered by a lack of volunteers with the right schedule or skill set, the ease of ServeGR's use makes screening for essential talent much simpler. It's just as important to the livelihood of nonprofits as a strategic plan or a targeted social need. And it can be cultivated in ways that reach beyond donation drives, organized in willing ranks of volunteers across the strata of West Michigan. ServeGR, a new hub for volunteer efforts in the region, helps centralize opportunities for those looking to give. And where nonprofits may have previously been hampered by a lack of volunteers with the right schedule or skill set, the ease of ServeGR's use makes screening for essential talent much simpler. Under the leadership of director Heather Colletto, a handful of nonprofit organizations have already signed on to promote their workforce needs. It's a new approach to matching donations of talent and time to community organizations that need it most, and it couldn't have come at a more crucial time. ServeGR was rolled out amidst the turmoil and uneasiness of the weeks leading up to the last presidential election. Colletto had seen the summer interviewing nonprofits with volunteer positions available, discovering their individual needs and the best way to meet them. And after a few targeted promotions, she had been waiting for the holidays to push the project live. But it wouldn't be 2016 without political interference, though, and the same events that conspired to foment the democratic process provided Colletto with the motivation to release ServeGR to the public. "What I saw in my gut, after the election, I was hungry to do something and to not get overwhelmed by the big picture," she says. "Just thinking about where I'm at, what I'm good at, and making a difference right here. That seemed to resonate with people." Colletto has been resonating with people since a very young age. She grew up telling stories, which evolved into a college career, where she experienced her "lightbulb moment." "I realized I could tell the stories of non-profits and the incredible ways they can change someone's life," she says. "Connecting someone to that story, to that mission never fails to excite me." She translated an English degree from Rutgers University into a professional career in non-profit fundraising and communications. Her work in the non-profit sector would take her from Grand Rapids to the Slovak Republic, where she shared local stories through a media platform to gain traction with new donors. From there, Colletto made her way to Thailand, coordinating communications and donor relations for the SOLD Project, which confronts child prostitution through education. After returning to Grand Rapids in 2012, she connected with the Children's Assessment Center as a volunteer herself before landing a position as development and communications coordinator for the YWCA. In 2014, Colletto became board vice president of the Eastown Community Association, and a year later she joined the Westminster Presbyterian Church as Minister for Mission, where she now facilitates ServeGR. The program was initially created through funding from the Westminster and is housed within the church, but ServeGR itself is not faith-based. As a contrast to the fundraising methods Colletto has seen in the past, asking donors for money, ServeGR replaces financial donations with strengths and valuable time. That resource is arguably even more important, she says. "Nonprofit staff members are always wearing a lot of hats and the more people they get to volunteer, the more of their work and vision they can get accomplished," Colletto says. "We're never going to be able to solve all of those problems. I just believe that people want to do this, that there is a desire for people to connect in this way, and make a difference in this way." Where nonprofit organizations may have found obstacles in the way of talented and available volunteers in the past, ServeGR handles those issues with education and technology. Colletto spends hours interviewing nonprofits about their needs and ideal volunteer candidate, then translates those details into a entry on the website that potential volunteers can read and consider. It's the organization's mission to match each individual's unique combination of strengths, passion, and availability to opportunities throughout the greater Grand Rapids area, assisting with any questions or concerns up until the first shift. If volunteers aren't showing up, she says, it could be they just don't know what they're getting into. They could be confused about how to get started, or even lack essential skills, details that can be communicated by a ServeGR post. "We can't solve that problem fully, but I feel like the more information we give up front, the matches we make will hopefully be more in quantity, but also in quality," Colletto says. "We really are trying to make a tool for organizations to get the right people helping." 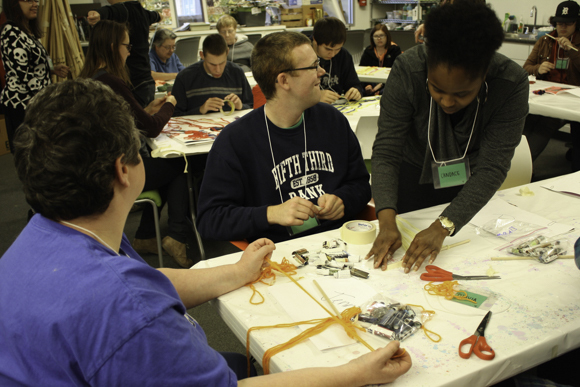 Volunteers help individuals with disabilities create art during Artists Creating Together's Adult Art Class. ServeGR acts as an enhanced job board for potential volunteers and leaves the actual hiring process to the projects in need. An early version of ServeGR required volunteers to sign up through the website, Colletto says, but that was more than was necessary. "The organizations are the experts on what their needs are," Colletto says. That doesn't reduce ServeGR's role in the process, however. There are nuances to each opportunity that don't always get communicated in a simple job description, and ServeGR offers a clearer picture. As an example, Colletto offers D.A. Blodgett's Sisters-In-Support group, which helps mothers in the community. To qualify for the volunteer position, applicants must be a certain age and have a valid driver's license, but there are less obvious requirements, too. "When I spoke to their coordinator about the volunteers that actually 'get it,' the ones who really make a difference with these women, they're the ones who understand they're going to have a different set of challenges when they work with cultural differences and understand that this is a long process," Colletto says. "And there are so many things that would make someone excel at being a mentor that are really more soft skills. Being a good and patient listener. Those are vital requirements for an opportunity." Using analytics tools and listening to its users, ServeGR has already been through a few iterative adjustments. After one potential volunteer asked for clarification to the onboarding process for a particular opportunity, Colletto was able to simplify and improve the way volunteer job postings were made across the board. Given the size of the organization and Colletto's vigilance, updates roll out fast. "It's really important that there's a strong customer service focus on the site, which is why there's a photo of me and my name there," Colletto says. "It lets organizations know that they can reach out when a need is met or they've changed their process, and we can make changes to the site really quickly." National platforms like Idealist.org, volunteermatch.org, and herofindr.com can connect users to volunteer opportunities, but only ServeGR is centered in and on West Michigan. Users can call or email Colletto for anything from extra information about an opportunity to help finding the right one. "Just last week I spoke to a woman who was having a hard time deciding between three different options and wanted me to walk her through it, so we did," Colletto says. "We looked at her schedule and when she could volunteer, but mostly about what here strengths are, and what would be the best fit for her." Staying in contact with the organizations in need of help, as well as volunteers who have been through the process and can offer testimony, helps establish a feedback loop for ServeGR's constant improvement. Not that there's room for much. "We've gotten really positive feedback so far from organizations," Colletto says. "One especially popular opportunity on ServeGR immediately following the election was being a Cultural Mentor for New Americans, welcoming and acclimating refugees to life in Grand Rapids." The Creative Youth Center, which holds a volunteer staff of as many as 25 mentors and writing tutors, is also working with ServeGR. Director Brianne Carpenter says the website provides an innovative approach to categorizing and presenting volunteer opportunities in West Michigan, and serves to build a stronger community at the same time. "It's focused on Grand Rapids and something like that hasn't existed until now," Carpenter says. "It makes it really easy to search through experiences and see how you might volunteer because it's always written in the same voice. That's something that I haven't seen in any other volunteer platform." In connecting with ServeGR about posting volunteer opportunities on the site, Carpenter says Colletto's focus was on making an effective tool for nonprofits to use, easily. They were able to differentiate between assistants for after-school workshops and writing tutors, and clearly define the requirements for each, simplifying the Creative Youth Center's on-boarding process, as well. It may take a national election to motivate some to volunteer, but Grand Rapids isn't at the bottom of any list when it comes to giving. Carpenter says, as her role puts her in contact with volunteers and nonprofit leaders throughout the community, attitudes of generosity have been on an incline all year. 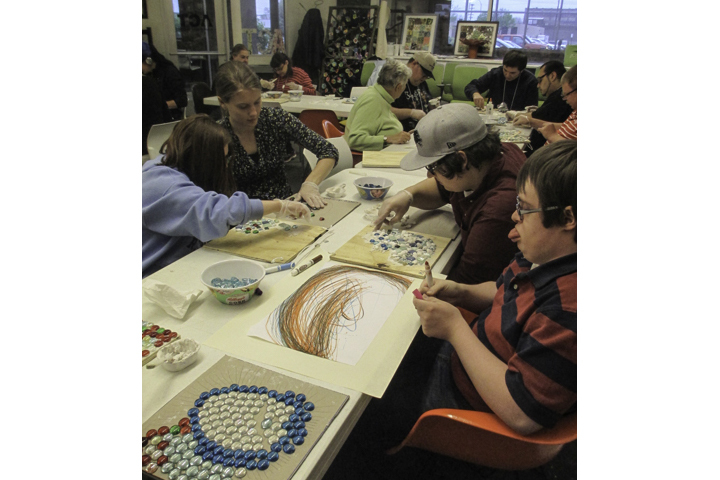 Volunteers help individuals with disabilities create art during Artists Creating Together's Young Adult Art Class. "I think Grand Rapids has a history of being a very generous community, particularly financially, but with the volunteers that we have here, and with the community partners that I see regularly, there's been an outpouring of interest in giving," she says. And for directing that interest toward the organizations that can benefit most, ServeGR is here to help. Colletto feels strongly about connecting people to a cause that they are passionate about because it creates a spiral of success. Anyone who is volunteering or working in a way that plays to their strengths is going to find they're much better at getting the task done, she says. Likewise, organizations will experience less turnover, and their clients will leave with a better experience. Financial contributions are crucial to the success of any non-profit, but as we understand the importance of community building and putting time and talent where it's needed most, volunteer hours become just as vital. It's a directional shift for Colletto, as well as the giving economy as a whole. Away from asking people to make a difference with their dollars and toward asking them to make a difference with their time. Resources and the resourceful all connect at ServeGR.com. Urban Innovation Exchange highlights the people and projects transforming West Michigan through sustainable efforts. Matthew Russell is the editor for UIX Grand Rapids. Contact him at matthew@uixgrandrapids.com.